Passenger service: 1915 - May 1924. Existing abandoned portions: 1 island platform (between a freight track and an abandoned trackway). 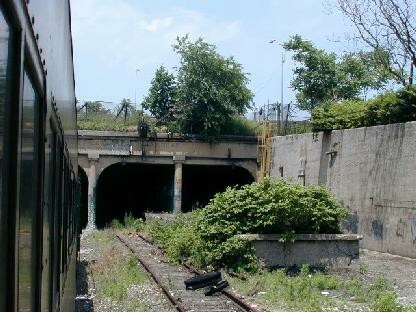 Touring: Part is visible from the public street, on Van Sinderen Ave south of East New York Ave.
East New York was a station on the Long Island Railroad's Manhattan Beach Branch, which ran from Long Island City to Manhattan Beach, the part of Coney Island east of Brighton Beach. The route was originally built in 1877 as one of the several summer railways that ran to the beach. The railroad was roughly a T shape: a north-south trunk from Manhattan Beach to Flatbush, and then branches at right angles to Bay Ridge (boat to New York) and Long Island City (ferry to New York). Manhattan Beach was easily the largest and most exclusive property on the island, with its two luxury hotels and open spaces and with none of the tawdry amusements found to the west. But by 1910, its day was past: the railroad was down to four trains a day each way, and the property was sold for building lots. Service ended in 1924. The Manhattan Beach Branch's original East New York station was at street level at its crossing with the Atlantic Branch, which was also at street level. Still a relatively remote spot in 1880, very nearby were also the terminal of the Brooklyn and Rockaway Beach Railroad that ran to Canarsie, the terminals of city streetcar lines and of the streetcar to Jamaica, and after 1888, stations of two elevated lines, all brought together by the lay of the land and the Brooklyn street pattern. It was sometimes known as Manhattan Junction or Manhattan Crossing. The Brooklyn Grade Crossing Elimination Commission was created by the New York State legislature on May 9, 1903 to accompish the goal of providing fully grade separated rights-of-way for the BRT's Brighton Beach Line and the Bay Ridge and Manhattan Beach lines of the LIRR. Its work was completed by May 1918. The work was paid for jointly between the City of New York, and the LIRR and BRT, as a public/private partnership. 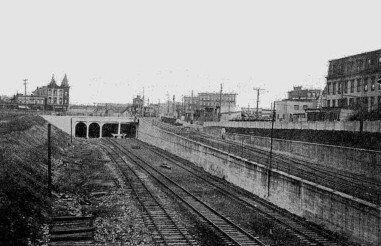 At East New York, a half mile tunnel for four tracks was constructed under the ridge, both to get the line off the street and to increase its carrying capacity. Part of the old Manhattan Beach Branch was getting a new use, and a new name, the Bay Ridge Branch. The Pennsylvania Railroad had acquired the Long Island Railroad in 1900, and was now putting together a freight main line to New England, by way of carfloat from Greenville (southern Jersey City) to Bay Ridge, the Long Island Railroad from Bay Ridge to Fresh Pond, and the new New York Connecting Railroad over the Hell Gate Bridge. The minimal passenger service to Manhattan Beach ran a distant second in consideration, but it was provided for. The new station at East New York is partly in tunnel and partly outside in cut. It was just a simple concrete high platform between the two passenger tracks, with one stairway to the street. The station was not below the Atlantic Branch station, and was not connected to it. Passengers would have had to walk a short block at street level to make a connection. After just nine years, the station was closed when passenger service ended on the Manhattan Beach Branch. The stairway was closed up but the platform was left. The former northbound passenger track was lifted in 1939, and its tunnel was sealed at the inner end of the station platform. The Bay Ridge Branch was electrified in 1927 for freight service, using the 11kv AC catenary of the Pennsylvania and New Haven roads, not the third rail the Long Island used. For forty years, the Bay Ridge line was heavily used, but not for passengers. The wires came down in 1969, and the Bay Ridge line slipped into near abandonment, after the newly merged Penn Central rerouted all the freight traffic to New England by way of Albany, to avoid the marine operation across the bay. The East New York Tunnel is shown in red, and the station is shown as a circle at the south portal. The original alignment of the Manhattan Beach Branch up to 1915 is shown to the right. As a point of interest, the 14 St and Eastern Districts subway built for the BMT follows the original alignment. The note Sta at Eastern Parkway refers to a surveyor's location, not a planned railroad station. Brooklyn Grade Crossing Elimination Commission, Bob Diamond collection, from The Brooklyn Grade Crossing Elimination Project page. It has the large map of which this is just a detail. A spectacular aerial view from 1994 shows the same area. There appear to be no buildings directly over the tunnel, but it does pass right under that baseball diamond. Robert Emery made a detailed drawing of the area in 1958, based on Long Island Railroad Company files and conditions at the time. My notes in red summarize some of his handwritten notes on the sheet. Much of the information is about the freight trackage. An undated photo from the Grade Crossing Elimination Commission's report in 1918 shows East New York station, probably in 1915 before it opened, since the station platform does not seem to be complete (compare photo below). 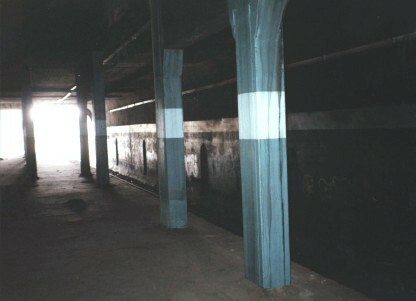 One of the freight tunnels was not in use until 1926, but the alignment shown here looks very temporary. By 1918, a BRT elevated line was up Van Sinderen Ave, the street along the right side. The ramp on the right takes a pair of tracks up to street level along the original line of the Manhattan Beach Branch. 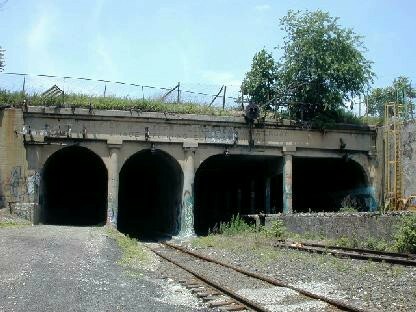 Once the tunnel opened, the ramp remained in use as late as 1939, as a freight connection curving to the right into the Atlantic Branch. It seems to have ended only because of the reconstruction of the Atlantic Branch that put it in tunnel east of East New York. In this image there appears to be a Manhattan Beach train near the top of the ramp on its way along the old route to Long Island City. Emery's documentation shows a signal maintainer cabin at that spot later. Brooklyn Grade Crossing Elimination Commission, Bob Diamond collection, from The Brooklyn Grade Crossing Elimination Project page. It has a larger version of this picture. Thomas Scannello took a series of photos of the entire Bay Ridge line on a fan trip in June 2000. The two above show the remains of East New York station. Across the top of the portal is the legend CITY OF NEW YORK LONG ISLAND RAILROAD / GRADE CROSSING ELIMINATION 1917. Both photos copyright 2000 by Thomas Scannello. From the New York and Atlantic / LIRR Bay Ridge Branch Virtual Tour page at OldNYC.com. Doug Diamond got a shot from inside the station in November 1999. Someone had taken the trouble to paint the concrete walls and columns in the recent past, but who can see it? Based on Robert Emery's notes, a view from this far in should show the stairway to the street, but it seems to be completely gone. The re-enforced concrete construction is obvious here inside. The columns that look rounded outside the portal are really square sectioned. Photo copyright 1999 by Doug Diamond. From the Bay Ridge Branch page at the Long Island Rail Road History Website . A photo tour of the entire Bay Ridge Branch can be found at OldNYC.com. Photos and maps of the Brooklyn Grade Crossing Elimination project can be found at rapidtransit.net. More historical data on the Bay Ridge Branch and its predecessor the New York and Manhattan Beach Railway can be found at the Long Island Rail Road History Website.